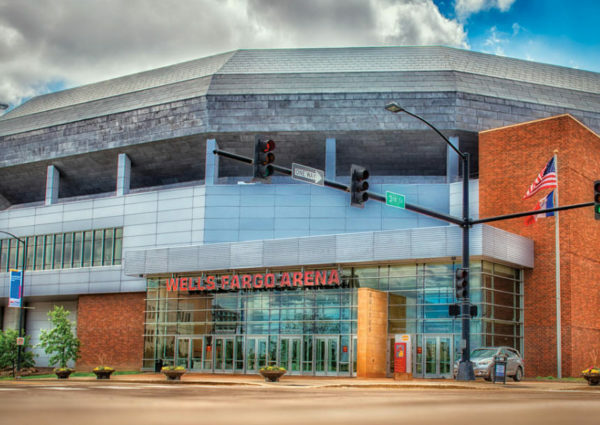 The Iowa Events Center includes Wells Fargo Arena, Hy-Vee Hall and Community Choice Credit Union Convention Center. The Proactive Policy related to Photography/Videography is intended to prohibit any inappropriate photography/videography that could put gymnasts in harm’s way or otherwise undermine the sport, while allowing appropriate photography or videography at USA Gymnastics sanctioned events. Spectator Audio-Visual Recording & Photography. Photographs or video may only be taken (a) in public view; (b) if they observe generally accepted standards of decency; and (c) are both appropriate for and in the best interest of the gymnast. All images taken during the event are for personal use only, and any commercial use, distribution or sale is prohibited. The use of professional equipment is strictly prohibited, including cameras with detachable lenses or lenses greater than 35MM, tripods and monopods. No flash photography or strobes of any kind. Live Streaming Apps. The use of live streaming apps (such as Facebook Live, Periscope, etc.) is not allowed in the venue during the competition or training. Signage/Banners. USA Gymnastics appreciates its fans’ enthusiasm and support of its athletes. Fans are allowed to bring signs and banners that are supportive of the athletes and national team; however, signs or banners with any other type of message are not allowed. Any signs and/or banners must not be larger than 24″ x 36″ or block the view of other spectators when displayed. Event Photography is provided by Team Photo for the entire event. Competition in the Greensboro Coliseum will be webcast live on the USA Gymnastics YouTube page. Should an athlete, or the parent/legal guardian in the case of a minor athlete, elect to opt-out of either of these, please provide written notice at registration. Rhythmic gymnastics is characterized by grace, beauty and elegance combined with dance and acrobatic elements, while working with ribbons, balls, hoops, ropes and clubs in a choreographed routine to music. The choreography must cover the entire floor and contain a balance of jumps, leaps, pivots, balances and flexibility movements. Only four of the apparatus are competed each quad, and the four for 2016 are hoop, ball, clubs and ribbon. Each movement involves a high degree of athletic skill. Physical abilities needed by a rhythmic gymnast include strength, power, flexibility, agility, dexterity, endurance and hand-eye coordination.